Sometimes a little help can go a long way. At Merrill Gardens, caring is more than a service we provide. It is an eyes-open heart-engaged lifestyle that champions our community members. We love seeing residents living fuller, happier lives when we are able to pick up some of the basics of daily living. Beginning with an individually tailored service plan, our Assisted Living program focuses on nurturing residents to reach their fullest potential. Services we can assist with may include bathing, dressing, grooming, medication management, safety checks, and more. Privacy and freedom of choice remain paramount in our goal of fostering independence. 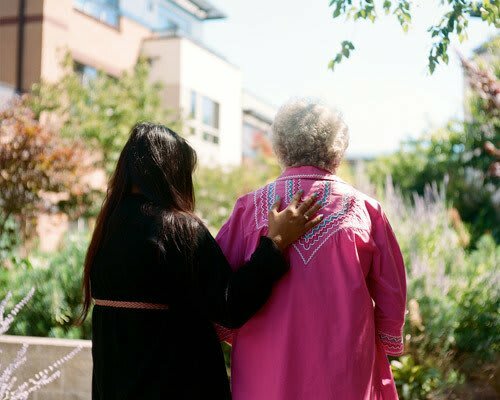 According to the results of a recent survey, Assisted Living can help create a sense of belonging and control for residents, easing the transition and fostering quality of life. Check out the results of this survey, which focus on the real-life experiences of residents and their family members. All of our programs are designed to foster independence. Enjoy More Anytime Dining gives residents flexibility in how they enjoy mealtimes on their own schedules. Our Active Living program promotes social activity, physical movement, and creative engagement, and the calendar is populated with all the things that residents want to see and do.